I have watched my Mother, Grandmother and other family members make this dish for breakfast, lunch or supper, and for me, I will eat it anytime, it is just that good. It is served on a fluffy hot biscuit or a crisp slice of toasted bread and no matter when you have it, this recipe is pure comfort, southern style! In a medium sauce pan, cover 3 or 4 potatoes (jackets on) with very salty water and boil until the potatoes are tender and can be chopped. In a large heavy skillet cook the breakfast sausage and onion until the sausage is cooked through and the onions are clear. Add the boiled chopped potatoes and mix with the sausage. In a mixing pitcher mix together the flour, milk, salt, pepper, Worcestershire Sauce and Tabasco. Make sure that the flour is thoroughly blended with the milk. Pour the seasoned milk and flour over the sausage, potatoes and onions. Stir the liquid with the sausage until the mixture becomes thick. You can thin the gravy by adding more milk a little at a time. Serve on hot biscuit's or crisp toasted bread. This Is Pure Southern Comfort! Sometimes in life we just need to find some comfort and this is one of the dishes that reminds me of comfort every time I take a bite. Thanks so much for stopping by to spend some time with us today and hope you have a great week! Looks like comfort food, Miz Helen! I can see why you love it any time of the day. I would, too. 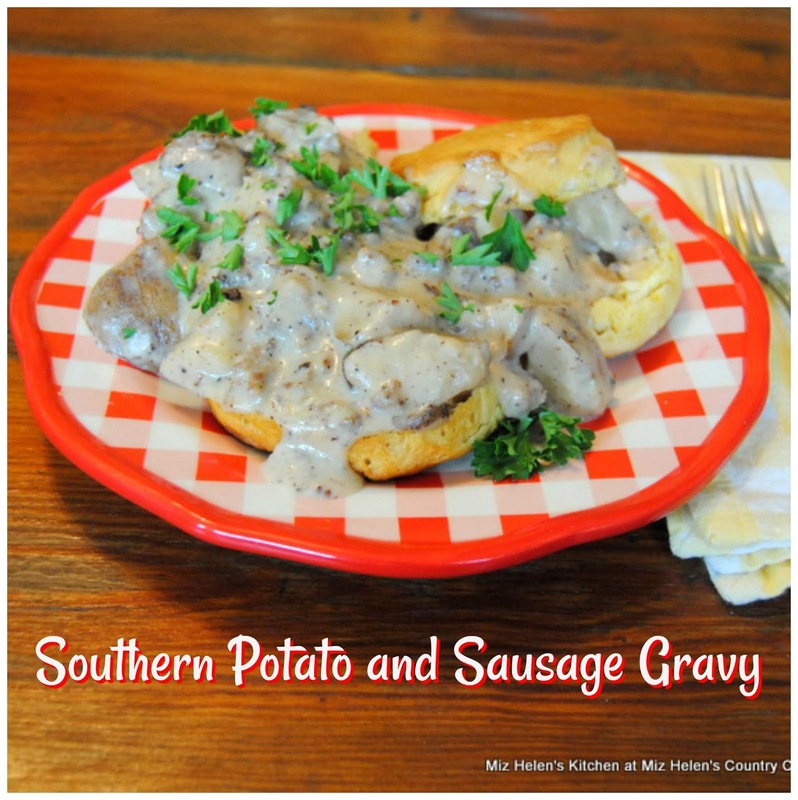 I've done biscuits and gravy but never with potatoes in it. I bet my husband would love this! Thanks for sharing at the What's for Dinner party. Have a great week! My mouth is watering right now! This looks so delicious. Thanks so much for sharing with us at the Whimsical Wednesdays Link Party Miz Helen and have a wonderful week!